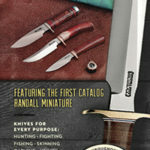 Randall Made Knives has an extended delivery time. NOTE: ORDERS ARE LIMITED TO ONE KNIFE PER HOUSEHOLD EVERY THREE MONTHS. Orders received now are being scheduled for shipment in approximately 6 years. Select your Model and list the additional features of interest. The price listed with each model is for the standard knife configuration. Customizations cost extra. Please refer to our extra features page for prices. Non-Catalog Models are at the bottom of the list. Choose a 5", 6", 7", or 8" blade for you knife. Choose a 5", 6", or 7" blade for you knife. Choose a 6", 7" or 8" blade for you knife. Choose a 5" or 6" blade for you knife. Choose a 4.5" or 5" blade for you knife. Choose a 4" or 5" blade for you knife. Please note, due to extended delivery times, Randall does limit the number of extra features that may be added to a knife. The limit is five chargeable features. Sheath specs do not count as part of the knife feature limit. If we may be of assistance with extra features that are available on a specific model, please contact us. Name Etching is a chargeable feature If you choose name etching on the blade as one of the five custom features above, please indicate etching specifications below. Etching is limited to two lines, and a max of 18 spaces per line, costing $30 a line. No symbols. Enter up to 18 characters for line one. Cost is $30 extra. NOTE: All name etching is done in UPPER CASE letters. Add a second line of up to 18 spaces for an extra $30.00 (total $60 for both lines). NOTE: All name etching is done in UPPER CASE letters. Please add any extra notes or comments pertaining to your order here. Important: Deposits are non-transferable and non-refundable. I understand my deposit is non-transferable and non-refundable. 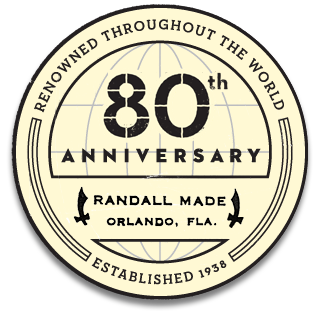 We certify that every Randall Made™ knife is 100% handmade in our own workshop and that it is made of the finest quality material obtainable. We further certify that the blade is hand-forged from the finest imported .01 tool steel or made of the best stainless steel, hand ground, hand honed, hand polished, that the blade is keen, perfectly balanced and perfectly shaped for its use, and that the material in the handle, whether heavy sole leather, stag, rare wood or another material, is genuine, and that the sheath is the finest obtainable. We warrant that each Randall Made™ knife is free from defects in manufacture and will be replaced should any appear, when in use by original owner. 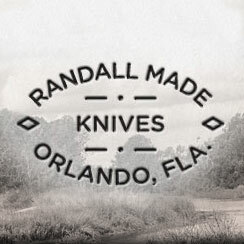 Randall Made™ will not be responsible for secondary work added to the Randall Made™ knife after the original purchase.